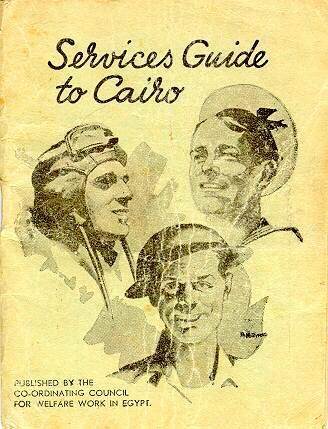 I have transcribed the "Sevices Guide to Cairo" as faithfully as html will allow me to do. My centre fold was missing, fortunatly a visitor was able to supply me with an image of his. His centre had a torn corner should you find you have another, I would like to recieve it. This section currently consists of two parts. The second is a full size reproduction of the map which is pasted in the back cover. I appologize for the size of these file, the first is not bad at 74K, but the map is 319K. The map is this size because I wanted to present it at it's full size and with reasonable detail. I hope you feel it is worth the time.